ARK's programme of events include seminars, workshops and policy fora. These facilitate dissemination and critical debate on key social and policy issues. Our events attract a wide audience, including general public, policy makers, practitioners, journalists, students and academics. There are no forthcoming events listed at the moment. Please check back later. What is the problem with Social Care? Ann Marie Gray, ARK Co-director and Professor of Social Policy at Ulster University, presents her Inaugural Professorial Lecture. Across the UK, social care systems have been described as being in crisis with growing demand, increasing levels of unmet need, concerns about quality and standards and decline in public faith. Much of the blame for this has been directed at resent austerity. However, the problems with the social care system are deeper, rooted in its history and evolution and lack of public visibility. While the NHS is one of our most valued institutions, social care has had little public salience. This lecture looks at the challenges facing the social care service and at potential policy solutions. The lecture will be held on Wednesday 27 March 2019, at Ulster University Jordanstown campus, from 6pm - 8pm. Full details on how to register are available on the Ulster University website. This one-day event will present key findings of an ESRC-funded study which explores public attitudes in Northern Ireland to abortion. This project also compares the experiences of women here who take abortion pills obtained via the internet with those of women in Scotland who take the same pills via the NHS. In the morning session, speakers will report on research findings. In the afternoon session, a panel of policy makers will respond to the research findings. The event will be held on Friday 8th March at Belfast Campus of Ulster University, York Street from 10 am to 3pm. Tea/coffee will be available at 9.30. The event is free. Places are limited, and must be booked in advance via Eventbrite. Volunteer Now are delighted to have worked with the Young Life and Times Survey in order to explore the attitudes, views and experiences of young 16 years olds in relation to their volunteering experiences (or not). Their views enhance the picture of volunteering within Northern Ireland and this seminar will explore the research, bring it into context with other research and enable participants to formulate a strategy as to how we can encourage and embrace young people into the world of volunteering. 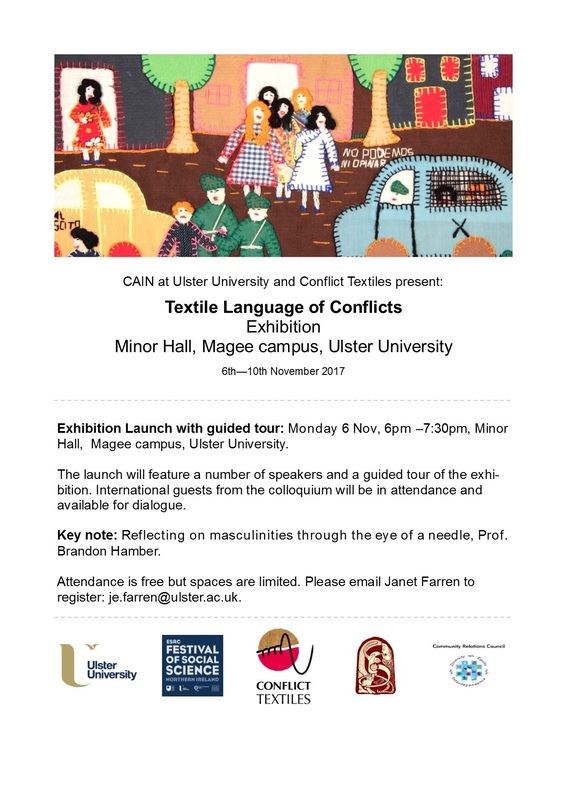 This event will take place on Wednesday 5 December 2018, at Malone House, Barnett's Demsene, Belfast. Registration and Tea/Coffee/Scones is at at 9.45am, and the seminar will run from 10am until 12 noon. (Please note that the date has been changed for this event). For 20 years, ARK has been recording public attitudes to key social issues in Northern Ireland, via our three annual surveys. These data provide authoritative, independent and statistically-robust evidence which is freely accessible to everyone. At this event, we will celebrate the wealth of data provided by the surveys. We will also launch a publication which outlines public attitudes over time to key social issues, and highlights the major contribution that the surveys have provided to policy making in Northern Ireland. The event will take place on Tuesday 27 November at 4-5pm, in the Harberton Room, Malone House, Barnett Demesne, Belfast BT9 5PB. In this seminar, Lucy Michael (Ulster University) will review data from the Northern Ireland Life and Times Survey and Young Life and Times Survey on attitudes to refugees, asylum seekers and ethnic minorities. In addition, she will consider the extent to which refugees both represent a unique focus for attention within the immigrant population and also offer a proxy for other kinds of views on immigration. The seminar will be held on Thursday 22 November, from 2.45 to 4pm, at NICVA, 1 Duncairn Gardens, Belfast BT15. 2GB. Refreshments will be available at 2.30pm. In 2107, our Reel Life Data competition set the challenge of making a short film based on public attitudes recorded in the Northern Ireland Life and Times Survey. The focus was on LGBT lives in Northern Ireland. Please join us to celebrate the films, and explore how film can bring data to life. This events marks the launch of the findings of the 2017 Northern Ireland Life and Times Survey. This seminar, by Professor Chérie Armour and Dr Bethany Waterhouse-Bradley (Ulster University), reports on the first ever survey of public attitudes to Armed Forces veterans conducted in Northern Ireland. This discussion session will explore the potential of intergenerational approaches to educational attainment, and in particular, the benefits for community planning. The event will also highlight the University of Strathclydes model of intergenerational mentoring. What works in improving educational attainment? This seminar will focus on initiatives that aim to improve educational attainment. Liam O’Hare (CESI, Queens University Belfast) will discuss his experience in designing, implementing and evaluating education attainment programmes. Alistair Wilson and Katie Hunter (University of Strathclyde) will outline the successes and challenges of intergenerational mentoring in increasing educational attainment. The seminar will be held in the Senate Room, Queens University Belfast, at 2.30pm on Monday 4 June 2018. Places must be booked in advance by contacting e.gray@qub.ac.uk by 30 May. As every year, we are holding a survey results launch event prior to making the most recent YLT and KLT survey results available to the public. The 2017 survey results launch takes place on 23 May 2018, 11.30-13.00 in Room G007 in 69/71 University Street, Belfast (School of Social Sciences, Education and Social Work, Queens University Belfast). To register for this event, please contact Eileen Gray e.gray@qub.ac.uk or 028 9097 5906 by 18 May 2018. This seminar will explore friendship, ageing and intergenerational relationships, and is hosted by the British Society of Gerontology (Northern Ireland)and the School of Social Work and Social Policy, Trinity College Dublin. This course will outline creative research methods and show you how to use them appropriately at every stage of the research process. The course assumes that you have a good working knowledge of conventional research methods, and builds on that knowledge by introducing arts-based methods, research using technology, mixed methods, and transformative research frameworks such as participatory and activist research. Any or all of these techniques can be used alongside more conventional research methods and are often particularly useful when addressing more complex research questions. The day will include plenty of practical advice and tips on using creative methods in research. This course will be held in Queen's University Belfast, and is organised by the National Centre for Social Research (NCRM). For more information, including details on how to book, please visit the NCRM website. This event is part of the Imagine Festival of Ideas and Politics, and will be held in Queens Film Theatre Belfast. Tickets are free, but must be booked in advance from the Imagine website. Bonfires and Flags: what do people in Northern Ireland think? Using data from the most recent Northern Ireland Life and Times Survey, Gillian Robinson (ARK, Ulster University) and Paula Devine (ARK, Queen's University Belfast) will explore public attitudes to bonfires and flags. The seminar will take place on Wednesday 22 November from 12 noon to 1pm, in the Baskin Room, Skainos Centre, 239 Newtownards Road, Belfast, BT4 1AF. The event will be followed by a light lunch. In this seminar, Professor Jill Manthorpe (Kings College London) explored relationship-based safeguarding, which seeks to meet the needs of service users and carers. It also promotes quality of life, and aims to provide care that is both personalised and preventative. The seminar took place on Thursday 16 November 2017, in Queen's University Belfast. This short course is designed to give participants a practical introduction to data linkage and is aimed at researchers either intending to use data linkage themselves or to analyse linked data. Examples of the uses of data linkage, data preparation, methods for linkage (including deterministic and probabilistic approaches) and issues for the analysis of linked data are covered. The main focus of this course will be health data, although the concepts will apply to many other areas. This course includes a practical example involving data to be linked, to enable participants to put theory into practice. ARK is holding its joint results launch event for the 2016 Kids Life and Times (KLT) and Young Life and Times (YLT) surveys. This is an opportunity for anyone working with or on behalf of children and young people to hear about key results before they are being made available to the public. The results of the 2016 NI Life and Times survey will be launched at a seminar on 16 June. Ann Marie Gray will discuss public attitudes to abortion, including attitudes to existing law on abortion, whether the law should be changed and in what circumstances, and views on the criminalisation of abortion. The seminar explored issues related to older kinship carers from different perspectives – research, personal experience, an NGO organisation, and a practitioner. In particular, highlighted the link between kinship carers and inequality, in relation to age, gender and location. The keynote speaker was Dr Anna Tarrant, University of Lincoln. This seminar was supported by British Society of Gerontology in Northern Ireland, and Keele University. ARK Ageing Programme Visiting Fellow Anna Tarrant, University of Lincoln a seminar, drawing on a number of linked qualitative longitudinal studies conducted over a ten-year period in a city in the North of England. The presentation focused on the lived experiences of men who are kinship carers. This seminar was delivered jointly with the Institute for Research in the Social Sciences at Ulster University as part of the Pushing the Boundaries seminar series. Votes, People and Parties - whats next for the Assembly? On the eve of the Northern Ireland Assembly Elections, ARK and INCORE invite you to a Public Seminar: Votes, People and Parties - whats next for the Assembly? by Dr Nicholas Whyte. Dr Whyte is a Visiting Professor at Ulster University, and Senior Director, Global Solutions in the Brussels office of APCO Worldwide. He runs the Northern Ireland Elections website on ARK. The event will take place in Room MI021, Ulster University, Magee campus, Derry/Londonderry, on Wednesday 1 March 2017, at 1-2pm. Light refreshments will be served. This 1-day course will help researchers identify the most appropriate software to facilitate qualitative or mixed methods analysis for their project. This course is organised by the National Centre for Research Methods, and will take place in Queens University, Belfast. Something of Who I Am uses objects to take you on the Journey of Life, as negotiated by six people living in Northern Ireland. This exhibition is part of the Lively Project, in which six participants have volunteered six objects each as offering some insight into a significant moment or memory on the ‘vapour trail of life’. Visual artist, Gemma Hodge has produced a number of artistic works which illuminate the significance of the objects. Participants have also produced art and craft work of their own. The launch will take place from 6-7pm on Wednesday 7 December, at the Crescent Arts Centre, 2-4 University Rd, Belfast BT7 1NH. In this seminar, Dr Máire Braniff, INCORE Director, Ulster University, will draw on data from the 2015 Northern Ireland Life and Times survey. She will illustrate that far from increased synergy between the traditionally dualistic identities, Northern Ireland is characterised by continued social distancing which remains pronounced. The seminar will take place in NICVA, Duncairn Gardens, Belfast on Tuesday 6 December, at 11am, followed by a light lunch at noon.